Form: This book is tiny! At 8" by 5" the artist had a very small area to work with in rendering his subjects, yet each image is extremely detailed and realistic. The figures clothing, postures, and environments such as landscapes and homes were extremely carefully and accurately rendered. Nevertheless, the artists who painted these did not bother with the strict conventions of linear perspective that we see in Italian art from the same period. The space is constructed using a combination of intuitive perspective, some linear and vertical perspective. Atmospheric perspective is out of the question. One of the most splendid examples, the Trés Riches Heures of the Duc de Berry, was created in northern France and the Low Countries during the 14th and 15th centuries. 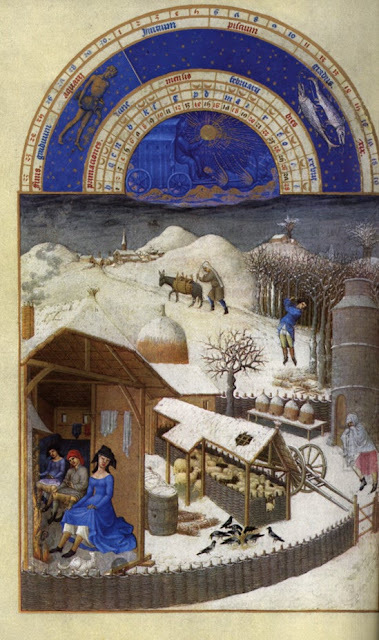 Now held in Chantilly at the Musée Condé, it is an excellent pictorial record of the duke's spectacular residences, with magnificent calendar pages illuminated by the Pol de Limbourg and his brothers (c. 1414-18), as well as many biblical scenes and illustrations of the lives of the saints. Most likely, the use of the book of hours and specifically this one is based on this Bible passage from Ecclesiastes. The passage and the pages might share the following. In almost all of the images from this manuscript there are images of work in the foreground of the image. In the background are images of castles and churches. It might be possible to conclude, at the risk of reading too much into things, that the kingdom of heaven awaits after all the hard work of living a righteous life is done. Limburg also spelled LIMBOURG (all b. after 1385, Nijmegen, Brabant [now in The Netherlands]--d. by 1416), three Flemish brothers who were the most famous of all late Gothic illuminators. They synthesized the achievements of contemporary illuminators into a style characterized by subtlety of line, painstaking technique, and minute rendering of detail. The sons of a sculptor, Arnold van Limburg, they were also the nephews of Jean Malouel, court painter to the Duke of Burgundy, and are sometimes known by the name "Malouel." The brothers worked together, and although the most celebrated appears to have been the eldest brother, Pol, it is difficult to distinguish their individual styles. About 1400 the brothers were apprenticed to a goldsmith in Paris, and between 1402 and 1404 Pol and Jehanequin were working for the Duke of Burgundy in Paris, possibly on the illustration of a Bible moralisée now in the Bibliothèque Nationale, Paris. Some time after Burgundy's death in 1404, they entered the service of his brother, the Duke de Berry, and it was for him that their most lavishly illustrated books of hours (the popular form of private prayer book of the period) were produced. 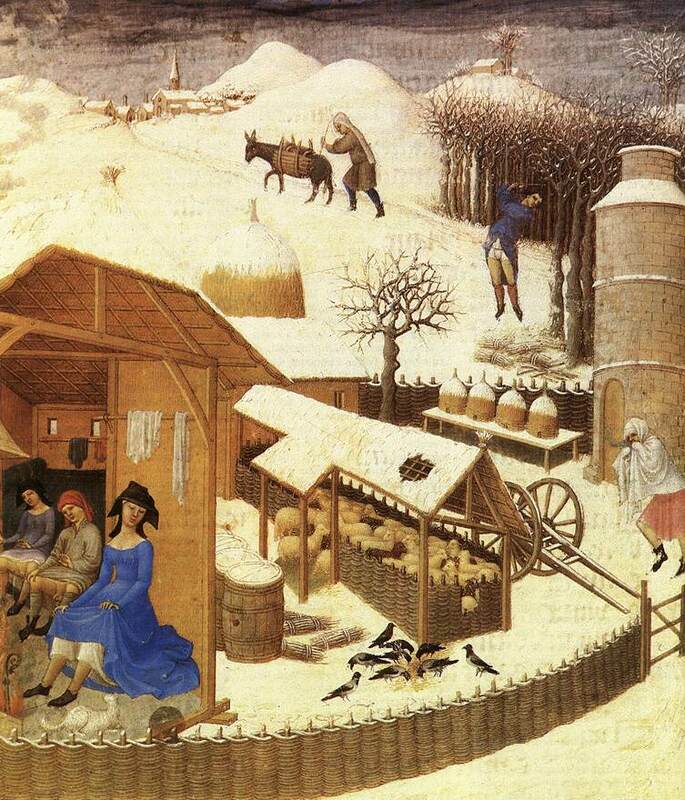 The Belles Heures (or Les Heures d'Ailly; now in The Cloisters, New York) show the influence of the Italianate elements of the contemporary French artist Jacquemart de Hesdin's illuminations. 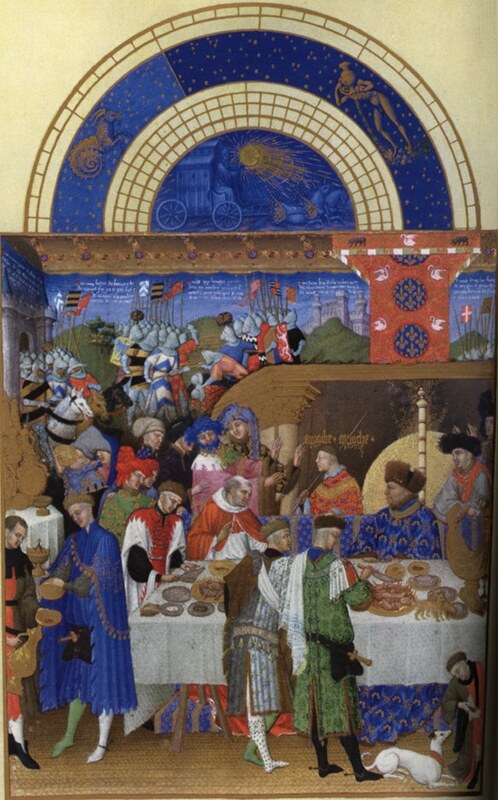 The Très Riches Heures du duc de Berry (Musée Condé, Chantilly, Fr. ), considered their greatest work, is one of the landmarks of the art of book illumination and ranks among the supreme examples of the International Gothic style. It is essentially a court style, elegant and sophisticated, combining naturalism of detail with overall decorative effect. An awareness of the most progressive international currents of the time, particularly those deriving from Italy, suggests that at least one of the brothers visited there. 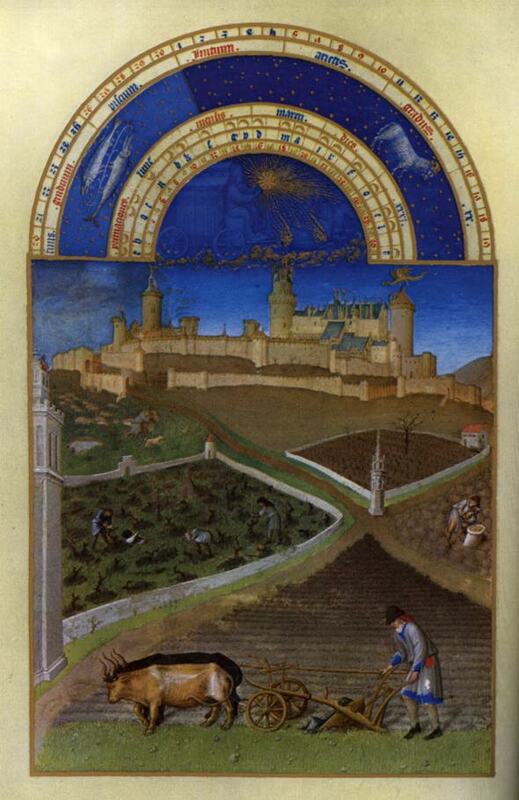 The Très Riches Heures was left unfinished in 1416 but was completed about 1485 by Jean Colombe.